Despite the issuing of a high number of asylum decisions by national asylum systems in the EU+ and a resulting decrease in backlog, nearly half a million cases remain pending. In January 2018, some 54,000 applications for international protection were lodged in the 28 European Union Member States, plus Norway and Switzerland (EU+). Despite issuing close to 60,000 decisions in the first instance, approximately 450,000 cases were still awaiting a decision. Even though these numbers are lower than for most of 2017, the figures indicate that the asylum situation in Europe is still not completely clear from the effects of the spike in applications in 2015-2016. Together, EU+ countries are issuing more first-instance decisions on asylum cases than the number of new applications that are being submitted, which reflects the success of the investment that Member States are making into backlog management and the continued focus on decision-making capacity in some countries. Consequently, there was a decrease in the number of pending cases, down from approximately a million in late 2016 to less than half a million at the end of January 2018. A third of all applications for international protection in the EU+ were submitted by citizens of just five countries: Syria, Iraq, Afghanistan, Nigeria and Pakistan. The number of Syrian applicants reached the lowest monthly number since February 2014, while some other nationalities increased. Of significance in the figures for January 2018, data shows that Georgians became the sixth most common citizenship among all applications in the first instance. The figures indicate that Georgians have been applying for asylum in increasing numbers since a Visa-Liberalisation agreement for travel in the Schengen Area took effect in March 2017. Reflecting this increase, in January 2018 applications more than doubled (an increase of 113%) the number registered four months earlier (from 874 in September 2017 to 1,859 in January 2018). Despite the increased numbers of applications and resulting pressure exerted on national systems, just 3% of Georgians who applied for asylum in the EU+ were granted either refugee status or subsidiary protection in 2017. 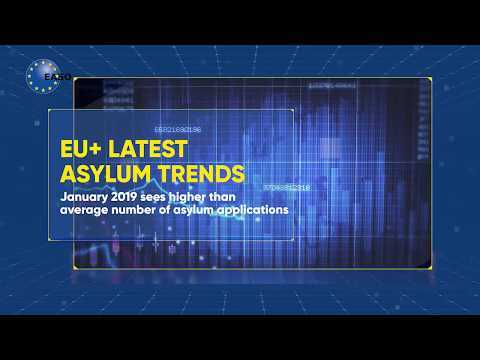 A recently-launched EASO interactive portal, which will shortly be updated with data from January 2018, allows users to visualise data on asylum applications, as well as on decisions and the number of pending cases in the EU+: www.easo.europa.eu/latest-asylum-trends.